The Chiropractic Center of Houston is dedicated to providing the best quality healthcare in a responsive and caring environment. Dr. Clemons has been licensed in Texas for more than 20 years and has post graduate training in spinal trauma involving auto injuries. When you come in for treatment, Dr. Clemons will gather information to understand your health issues quickly so that he can apply the right treatment to get you back doing the things you enjoy. Dr. Clemons graduated from Texas Chiropractic College in 1993 and obtained his certification in Spinal Trauma from West States Chiropractic College in 1995. 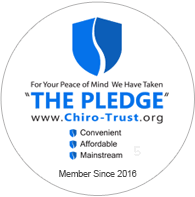 He is a member of the American Chiropractic Association as well as the Texas Chiropractic Association. Since 1995, Dr. Clemons has offered a personal approach to chiropractic healthcare to the downtown business community. Dr. Clemons has developed a solid reputation for effectively relieving a variety of ailments including: neck pain, headaches, back pain, sports injuries and auto injuries.